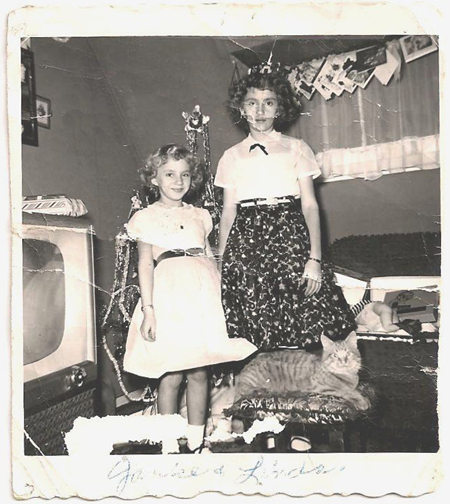 The Christmas photo (below) is of my sister, Linda Ritzert Scope, and me and our cat Taffy. It was taken on December 25th, 1955 in Detroit in the Quonset Huts where we lived until 1956 when everyone was forced to move out of the project. The quonsets were set up for the men coming home from the war. I am glad to have had the experience of living there. My sister and I have been trying to locate other people who lived there. I am also trying to find out what occupied that property before the huts were built as there are government cans buried in the ground that had cookies, jam, coffee, etc., in them. We are also trying to locate photos of the project so we can possibly publish a Arcadia book. Two things of interest popped up regarding the quonset huts. First was the comment by Don Paul of Livonia MI that he thought it may have been a Chrysler plant "behind" the huts. Actually, it was the Briggs Bodies Co. They built bodies for Chrysler. The plant extended from Warren Ave to Mack Ave. and abutted St. Jean on the east side of that street. Walter O. Briggs also owned Briggs Stadium (formerly the old Naven Field) and the Detroit Tigers. The second item was by Rick Tweedle. His family lived two doors west of us in the Parkside Projects. Hope all is well with him and his family. His mom was a pretty neat lady! I used to play with my best friend, Kelly Martinson who live in one of these homes. I remember them from the late forties and early fifties and they were located by my house on Detroit's lower eastside, between Freud and the Detroit River, near Montclair. The kids from these homes went to Lingemann Elementary, Foch Jr. High and Southeastern High School. For several reasons, this does not appear to be the quonset project I lived in on Connor and Corbett (near the Hudson Factory). Too many telephone poles. The roof overhangs don't look familiar and the fronts of the huts are too close together. I am really curious to find out where this picture was taken. Thanks for posting it. Can't say that I recgonize it but if my memory is correct there used to be a large quonset development on Connor roughly between Gratiot and Harper. I showed the picture to my father and he believes it is the same ones he lived in at Connor and Gratiot. Just on the east side of Gratiot. He lived there about a year before that picture was taken. I had a relative who lived in those Quonset Houses. I'm pretty sure they were on the south side of Conner, east of Gratiot. We used to visit there when I was VERY young, so the memory isn't as sharp as it used to be. That's my guess, anyway!!! The quonset hut photos look like the ones erected after WW2 for returning veterans. They were put up in an open field on the west side of Conner Ave. between Frankfurt and Shoemaker. They were across from the old Parkside Projects and were actually divided in half internally. Two families occupied each hut, entrances to each unit on each end of the hut. They were not insulated and were hot as hell in the summer and freezing in the winter. They were equipped with small but very ineffecient heating units. The grounds they were built on were previously used annually by Ringling Bros. Circus. I lived in Parkside and knew people who lived there. I believe the location is northwest corner of East Warren and Connor. Many huts were built there to accommodate the returning vets after WW2. The location is just across Connor from the Parkside Housing Project where I lived as a youngster. I was working for Michigan Bell as an outside plant engineer when they were abandoned/dismantled in late 50's. The only place I remember these Quonset Houses were on Conner, east of Gratiot. They were a few block from the police station. (Great Lakes Steel in Ecorse) brought another memory of Detroit to me. Remember the "portables" that were used at schools like Edison and Cooke in the 50's? Every kid hated those and hoped they would be assigned to a homeroom in the main bldg. They were cold and drafty and hot in the spring. So many neat memories. Quonset houses in Connor area on the east side of Detroit. I think the quonset huts were on Gratiot and Conner. There were some there when I was a young boy. If memory serves the quonset huts on the east side were located at the Nike Base, which became Heilman Field at 7 Mile Rd and State Fair. I know they had quonset homes at 7 Mile Rd. and Hoover (now Osborne HS). I worked at Anne's Dairy Bar with a girl who lived in one. They did not have an oven, so she cam to my home to bake one time. I think they also had them across from City Airport next to where old #15 police station was. Saw the picture of the Quonset hut homes. As a kid I lived in the Parkside Projects, the "new" side at 5422 Conner. I remember when the quonset huts went up. They were in the same place that Hammel Moving & Storage was later on and stretched toward Warren Ave. on the west side of Conner. They didn't last long. They were north of 8 Mile near Wyoming. I remember only one Quonset hut type of housing developement, it was located at Warren and Conner on Detroit's east side. I remember as a child, riding from my home in Sterling Township, going to Detroit Metro Airport to see the first Boeing 747 to land there. Somewhere along the the stretch of I-94 heading west between Detroit and the airport, I saw some "quonset huts" on what would be the south side of the freeway before getting to the airport property. Given the date on the photo submitted, I believe that they were built to house low income and immigrant families during WWII and others while their fathers were serving in the Korean War. Nice memories, as I haven't heard the term, "quonset houses" since my father passed in 2000. I believe that the Quonset huts were on Conner past Warren. I had an aunt and uncle who lived in one back in the 1950s. I think there was an auto plant behind them. Might have been a Chrysler plant? I don't know if this is correct, but I remember that there was a place near Gratiot and Conner, that had some of these units. This was about 1953. It looks like the one located on the north side of 8 Mile, near Wyoming. Allegedly, it was a German POW camp during the war. I believe it was torn down in the late 50's. My late uncle Joe Marr was one of the engineers who developed the Quonset Hut. He worked for Great Lakes Steel - Stran steel Division -and during WWII was sent to Quonset RI on this project. I do remember their slogan: "Your Business - Quonset Wants It." I remember him (in 1946) giving me a scale model of the hut for my 027 gauge Lionel toy railroad. May have some photos which I wll look for when I return to MI this summer. I would like to purchase Rodney Nelson's book when published. 8 Mile and Wyoming area. No, I was born in that "Project" there and it consisted of wooden, single level, multi-family units referred to as the "brown projects" and a similar unit covered with a white slate material that was called the "white projects"! Another single level unit directly behind the A&P market on the Northwest corner of 8 Mile and Wyoming were what was called the "green projects". One half mile North of 8 Mile were the 2 story units. The entire community in the '40s until its demise has been predominately African-American. I personally don't recall seeing any Quonset Huts there. I grew up in Detroit during the fifties in the neighborhood called Conant Gardens on Minnesota street. 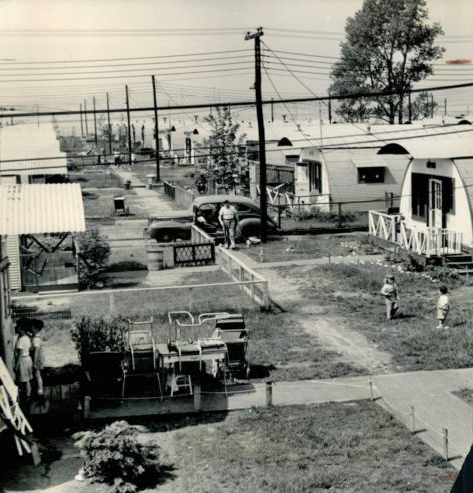 While I only vaguely remember the quonset huts, we lived in postwar army housing for the returning vets. These were similar to the huts, but were a lot nicer. Some people often confuse this housing with the quonset huts. Our buildings were similar except they were built in rows of about five housing units per building and faced the street with an alley in the back. We had a stove and oven in the kitchen, a pot bellied stove in the living room, a storage area on the back porch, and a coal bin out in the back yard. Our units had a fairly large back yard and were kind of sprinkled amongst the single family houses. It was a mixed neighborhood with Blacks and European immigrants living in the same neighborhood. I do remember that even as poor as we were, every yard was kept immaculent. The walls to our unit were so thin that you could actually put your fist through them. I went to Courville elementary, then to Foch Junior high school, I guess it's called a middle school now. After graduation, my mom got me into Cass Tech. As kids, we used to like to explore the several acres of undeveloped railroad property off of Ryan road. I'm in the process of writing a book about growing up in Detroit in the fifties which were some of the greatest years of my life next to my navy career. It wasn't just my neighborhood though, the whole city of Detroit was a wonderful place to grow up in back in the fifties. It had so much to offer when you think of the beaches, the parks, Belle Isle, the riverfront, Hudsons, the Bob Lo ferries and Bob Lo Island! My first submarine was the USS Piper in 1962. Imagine my surprise when I returned home in 1969 to find her parked down at the Broadhead Armory. I also worked as a photographer in the Hudsons advertising department.